June 29 (Thursday), St. Petersburg, Experimental Sound Gallery (ESG-21). Address - Pushkinskaya ul., 10 (entrance through Ligovsky pr., 53). Phones: 812) 764-52-58, (812) 764-52-63. Beginning at 21:00. Tickets - 150 RUR. JACOB KIRKEGAARD investigates sonic membranes and discrete interference occurring in different environments. Graduated from the Academy of Media Arts in Cologne Germany, Kirkegaard has lectured on archaeological and spatial aspects of sound at the Academy of Architecture in Copenhagen. 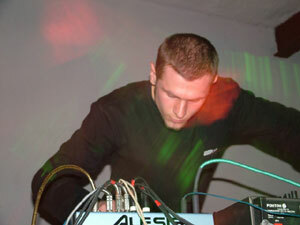 His works include live performances, film music, installations and compositions - 'Soaked', a collaboration with Philip Jeck (Touch, 2002), '01.02' (Bottrop-boy) and 'Eldfjall' (Touch, 2005). In his latest work '4 Rooms' (Touch, 2006), Kirkegaard explores the sonic legacy of the catastrophe on Chernobyl nuclear plant after 20 years of it's happening. The work is based on exploration of time existing imside of Zone of Alienation, by recording of silence in four radiating spaces. For this purpose Jacob deliberately picked rooms that once were active meeting points for people: a church in village Krasno, an auditorium, a gymnasium and a swimming pool in town Pripyat. The sound of each room was evoked by sonic time layering: In each room, he recorded 10 minutes of it and then played the recording back into the room, while at the same time recording it again. This process was repeated up to ten times. As the layers got denser, each room slowly began to unfold a drone with various overtones. 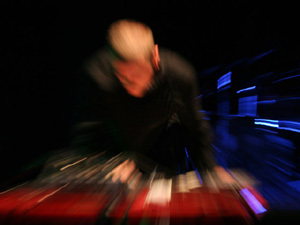 At this concert Jacob Kirkegaard will present the live version of his work accompanied with related video materials. For more information visit the artist's website: http://fonik.dk. St. Petersburg-based project KRYPTOGEN RUNDFUNK will keep the company this night. 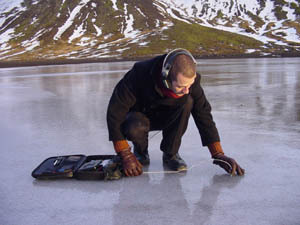 The project started in 2002 working with sonic energetic noise fields obtained from radio-receivers, old Soviet analogue technics and modern software tools.